Unlike conventional power generation facilities, wind and solar farms are significantly more dependent on the performance of an expansive cable collector system. With millions of dollars invested in collector system infrastructure and a lot of power riding on the line, site operators must make cable reliability a priority. Integrating IMCORP’s Factory Grade® technology with new site commissioning and existing site maintenance ensures proper system performance by locating problem areas to remedy before they develop into unexpected downtime. The function of renewable power sites (to generate and supply power) is based on the reliability of the expansive power cable infrastructure. 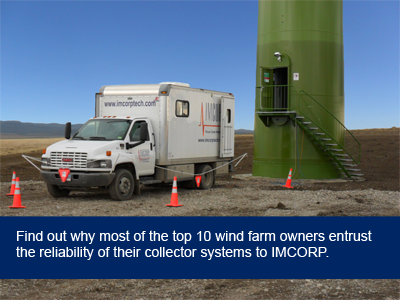 Depending on its location in the collector system, a single cable system failure can take the generating assets offline - causing lost power generation until the site of failure is located and remedied. Since 99% of cable failures are the result of defects originating in installation, verification of the cable system as a part of the commissioning process is vital to comprehensive operations oversight. Factory Grade® technology gives site managers the advantage of defect visibility to address problem areas before failure and lost power generation. Overvoltages and expansion / contraction cycles can create and exacerbate partial discharge (PD) activity - the forerunner of insulation failures - within a cable system. IMCORP’s Factory Grade® technologyis the most effective assessment available to locate these developing insulation problem areas before failure. Integration of Factory Grade® technology in an aged cable systems’ asset management program is the ideal solution to maintain maximum uptime.